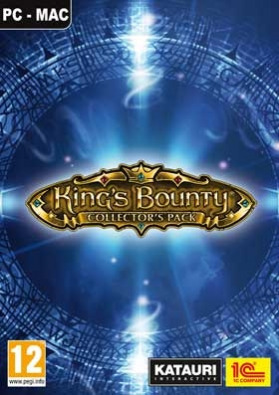 COLLECTOR'S PACKKing's Bounty: The Legend (EN FR IT DE ES)King's Bounty: Armored Princess (EN FR IT DE ES)King's Bounty: Crossworlds - Windows (EN IT DE ES)King's Bounty: Warriors of the North Valhalla Edition (EN DE)King's Bounty: Warriors of the North - Ice and Fire DLC (EN)Official ArtbookOfficial Soundtrack	NOTICE: Activation key must be used on a valid Steam account, requires internet c… onnection. ABOUT THE GAME	King's Bounty: The Legend is a fantasy saga, an exciting blend of role-playing adventure and tactical combat, stirring classic memories of the legendary 'King's Bounty' game. A hero (warrior, mage or paladin), and an army of his loyal companions in arms travel across a huge continent composed of dozens of linked locations. Setting kings upon the throne, overthrowing them, saving princesses from the claws of dragons, searching for pirates on the high seas, finding treasure chests, vanquishing villains who are attempting world dominationâ€¦ These are the everyday challenges the player â€“ the Hero - will face in Kingâ€™s Bounty: The Legend. Your character travels in real-time across land and water, underground, and across the skies searching for treasure, finding equipment, developing multiple skills and fulfilling the orders of kings to further his career. When fighting enemies, the game switches into Tactics mode. You can control your troops in the battle arena, use your spell book and summon powerful Spirits of Rage. As the plot unveils, the playerwill come across exciting puzzles and mysteries, and make many difficult decisions. Will you make alliances with a powerful necromancer or steal from the Dwarven treasury? Just never break the oath you gave to your King. He does not forget or forgive such sleights easily. KEY FEATURES Up-to-date engine that supports the latest graphics solutions. Flawless graphics style following classical fantasy traditions. Attractive, elaborate, and user-friendly interface. Thrilling plot written with the guidance of renowned sci-fi authors A combination of dynamic adventure and tactical turn-based battles. Heroes can move freely across the game world, consisting of dozens diverse locations. Three character types with different game play styles. A rich role-playing system including 7 parameters and more than 30 skills and perks, as well as a highly-developed system of tasks and reputations.. More than 70 spells to use in the battle arena and in travel. Alternate option for magical development involves summoning the legendary Spirits of Rage in combat. More than 60 unique creatures with special abilities and skills ready to fight in your army. Unique enemies and bosses. Dozens of different battle arenas. Unique arenas for castle sieges. Various traps and bonuses on battle arenas that can dynamically alter the course of combat. Unique system of living items which can act on their own and change their essence. Ability to find a wife, start a family, and have children! SYSTEM REQUIREMENTS Windows OS: XP, Vista, 7, 8 Processor: 2.6 GHz and better Memory: 2 GB RAM Graphics: nVidia GeForce 6600 with 128 Mb VRAM or similar AMD card DirectX: Version 9.0c Hard Drive: 8 GB available space Sound Card: DirectX 9.0c compliant	Mac OS: OSX 10.7 (Lion) and above Processor: 2 GHz Intel CPU Memory: 1 GB RAM Graphics: nVidia or AMD card with 256 Mb VRAM or more Hard Drive: 8 GB HD space Additional: 15 or larger screen is recommended. © 2012 1C Company. All rights reserved.